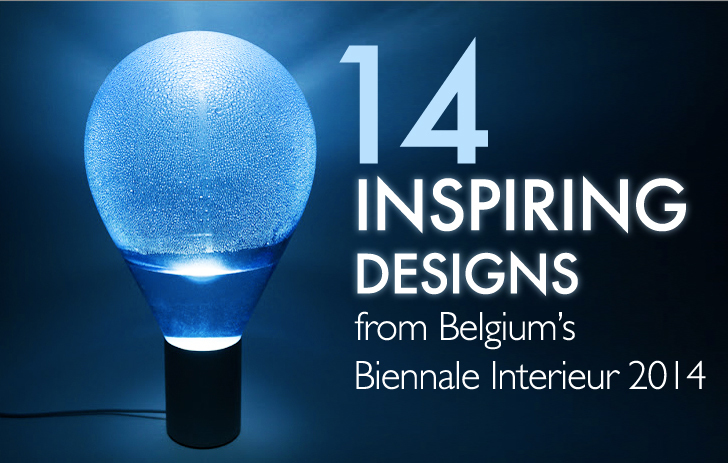 Belgium may be known best for its chocolate and beer, but the country has also cultivated a heady design scene—and it recently burst onto the international stage for the 2014 Biennale Interieur in Kortrijk. 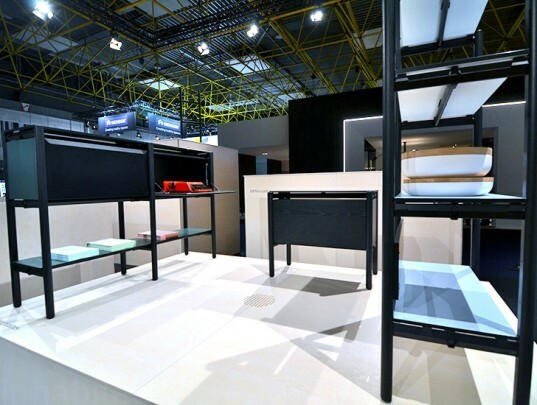 This landmark event showcased Belgium's best and brightest alongside talented designers from around the world, and we spotted scores of green design gems throughout the show. From shining solar tables and LED lamps to transforming furnishings and reclaimed wood wonders, read on for 14 of our favorite finds. 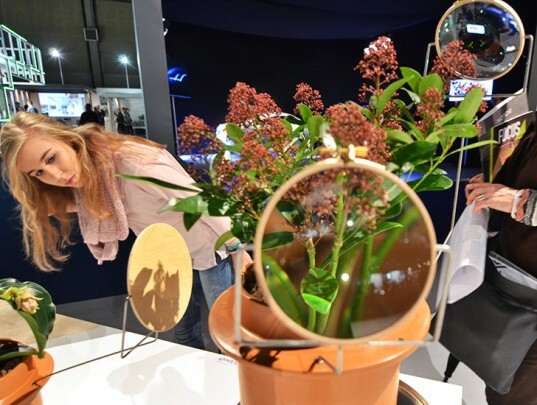 Dossofiorito invites you to take a closer look at your plants with their quirky Phytophiler pots, which come with built-in magnifying glasses, mirrors, and trellises. 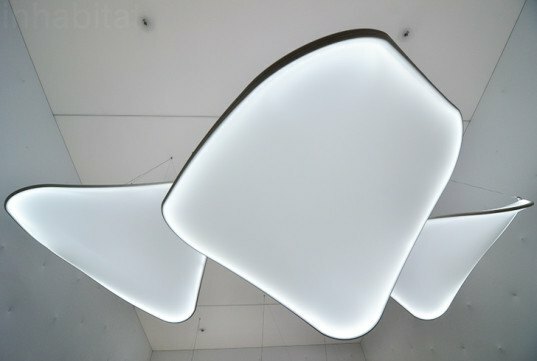 Ross Lovegrove teamed up with Barrisol to create a soothing white pavilion filled with sculptural hanging LED lamps. Flos‘ Goldman Light updates the traditional bottle green banker’s lamp with a pared-down profile and energy-efficient LEDs. Minale Maeda‘s clever Keystone Table is made from standard cuts of lumber and modular connectors that can be 3D printed on-site to minimize shipping emissions. Marjan van Aubel‘s elegant Current Table is clad with crystalline solar panels that power an integrated USB charging port. Per/Use‘s Piano Coat Rack folds flat against the wall when it’s not in use – however when company arrives you can flip out its keys to conveniently store hats, coats, and handbags. 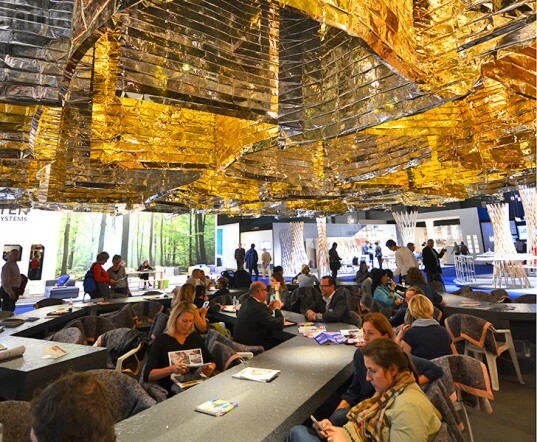 The “Dried Chat Room” is a cozy cafe made from surprising and inexpensive materials. Thermal emergency blankets create an eye-catching canopy, while recycled felt blankets cover plastic garden chairs perched at styrofoam tables. Bulo‘s new DAN line is a system of modular parts that can be combined to create a remarkable range of furnishings. 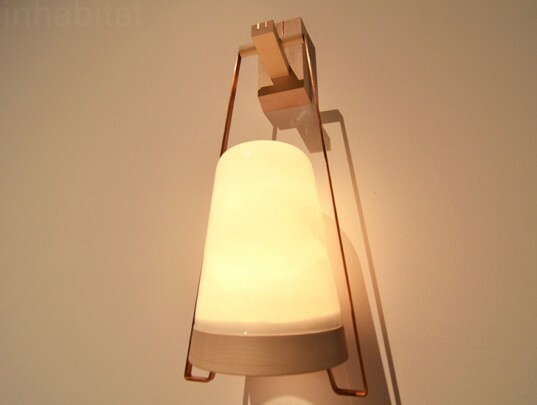 Lisa Muller and Franziska Schmidt collaborated to create the 24HRS Light – a portable, cable-free LED lamp designed to accompany useres day and night, reducing the need for secondary light sources. When it’s not in use the lantern sits on its rack, which doubles as a charger. 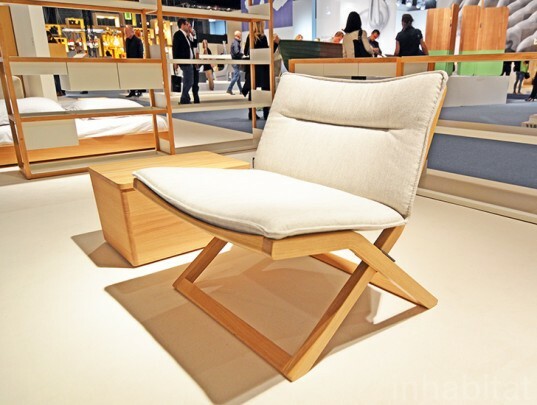 Brussels-based Marina Bautier scored the Biennale Interieur’s Designer of the Year Award for her collection of comfortable minimalist furniture realized in soothing natural hues. 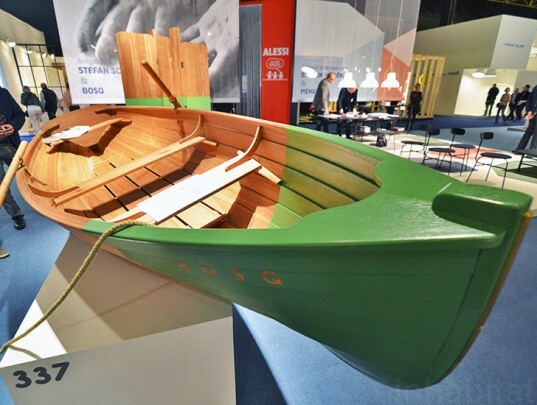 Bosq charted a quirky course at the interiors show by showcasing a beautifully finished boat made of wood reclaimed from pillars posted in rivers and canals. Eat your heart out, Lava Lamp – Atmos is an innovative liquid-filled lamp by Arturo Erbsman that diffuses light with droplets of water condensation. Verhaert designed a conceptual kitchen hood for Novy that automatically transforms and opens up when the light is switched on. 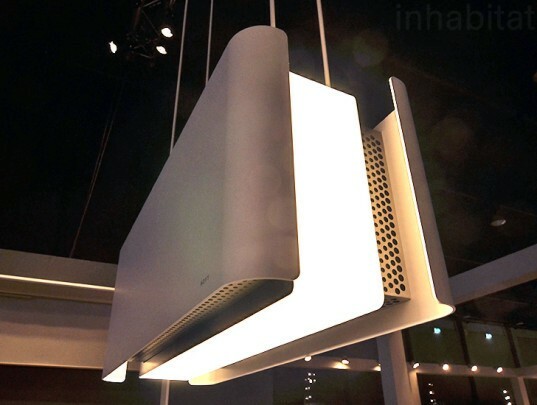 The hood goes beyond traditional exhaust fans by actively purifying the air in your kitchen. Acoshape‘s fun YOYO Lamps pair energy-efficient LEDs with acoustic foam that absorbs sound to create cozier interior environments. Flos' Goldman Light updates the traditional bottle green banker's lamp with a pared-down profile and energy-efficient LEDs. 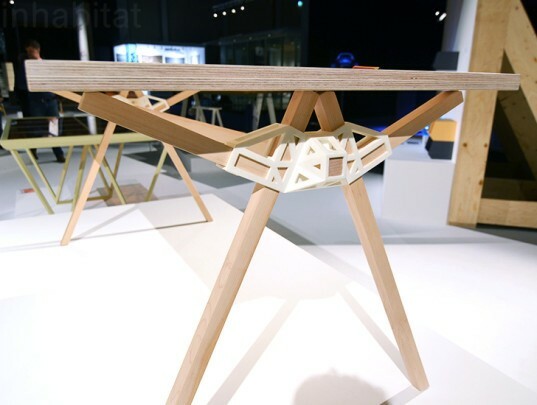 Minale Maeda's clever Keystone Table is made from standard cuts of lumber and modular connectors that can be 3D printed on-site to minimize shipping emissions. 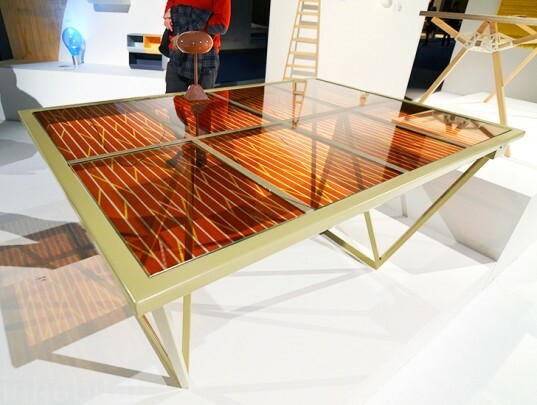 Marjan van Aubel's elegant Current Table is clad with crystalline solar panels that power an integrated USB charging port. 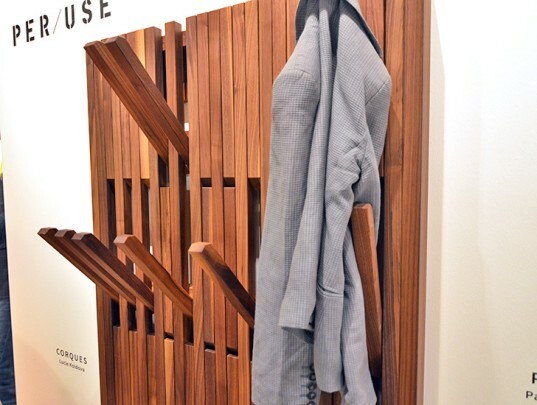 Per/Use's Piano Coat Rack folds flat against the wall when it's not in use - however when company arrives you can flip out its keys to conveniently store hats, coats, and handbags. The "Dried Chat Room" is a cozy cafe made from surprising and inexpensive materials. Thermal emergency blankets create an eye-catching canopy, while recycled felt blankets cover plastic garden chairs perched at styrofoam tables. Bulo's new DAN line is a system of modular parts that can be combined to create a remarkable range of furnishings. 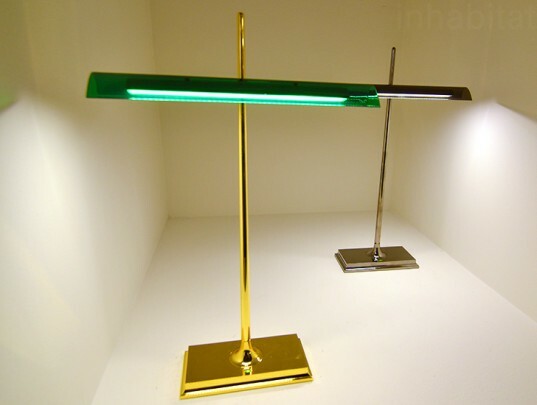 Lisa Muller and Franziska Schmidt collaborated to create the 24HRS Light - a portable, cable-free LED lamp designed to accompany useres day and night, reducing the need for secondary light sources. When it's not in use the lantern sits on its rack, which doubles as a charger. Brussels-based Marina Bautier scored the Biennale Interieur's Designer of the Year Award for her collection of comfortable minimalist furniture realized in soothing natural hues. 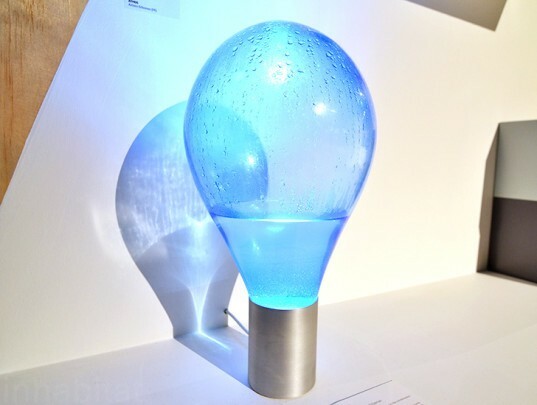 Eat your heart out, Lava Lamp - Atmos is an innovative liquid-filled lamp by Arturo Erbsman that diffuses light with droplets of water condensation. 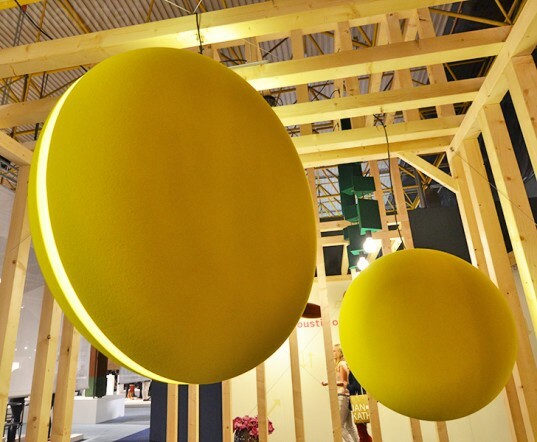 Acoshape's fun YOYO Lamps pair energy-efficient LEDs with acoustic foam that absorbs sound to create cozier interior environments.